While international forces in Afghanistan battle militants hiding in the mountains, aid agencies are fighting an even more elusive enemy: malnutrition. The World Food Program and UNICEF have launched a project to feed thousands of mothers and children — some too weak to cry. Aid workers hope a high-protein diet distributed through a network of village clinics can help them through the winter. Despite the billions spent in Afghanistan since the 2001 U.S.-led invasion to oust the Taliban, the country is still comparable to the worst humanitarian crisis zones in Africa. Afghanistan has the world's highest maternal mortality rate and the second-highest child mortality rate — and hunger is a major reason why, the United Nations says. This year, centers across the country will feed 100,000 children and 35,000 pregnant or breast-feeding women. Dozens of mothers, many clad in full burqa body veils, crouched in the clinic in Aqcha waiting for rations. The room was eerily silent except for gusts of wind that howled through the open door. Dozens of toddlers in their arms didn't make a sound. "Most of the children are too tired and hungry, they don't have the energy to cry," said Dr. Nasrullah Sulfane, who oversees the program here. The mothers received their weekly ration: 25 grams (0.88 ounces) of cooking oil with 215 grams (7.58 ounces) of corn and soya flour per child. The food doesn't cover all the children's needs, but it aims to provide the extra calories needed to avert the worst consequences of hunger. The program was launched in August amid widespread security concerns because Afghanistan's insurgents have increasingly tended to target aid workers. There also were worries that conservative villagers would not let their women go to the feeding centers, where they might encounter foreigners regularly. 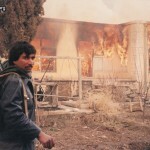 That didn't happen in Aqcha, a remote town lost on the barren steppes of northern Afghanistan. "So far, attendance is a real success," Sulfane said. "I think all the families understand the benefits of free food." Before receiving their rations, mothers balanced their toddlers on a scale used to identify children in deteriorating condition. Two-year-old Sharafuddin weighed in at 9.5 kilograms (20.94 pounds).That's extremely light for a 2-year-old boy, but the aid workers were thrilled — a month before, he had weighed just 8 kilograms (17.64 pounds). The last government survey, conducted in 2004, shows that 48 percent of Afghan children are malnourished and another 5 percent acutely malnourished. Indicators tracked by U.N. and Afghan government agencies paint an alarming picture of chronic hunger: 70 percent of children lack iodine, which can cause mental disabilities. A lack of vitamins and proper nutrients means much of the population has poor eyesight. Stunted growth is widespread. 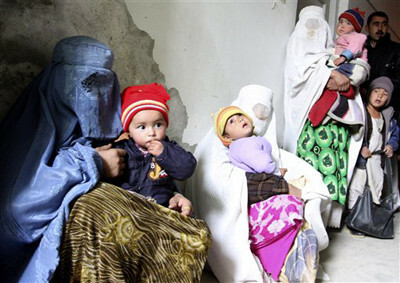 A quarter of Afghan children die before the age of five and nearly 2 percent of women die while giving birth. "We're very happy for him. He's just graduated to 'moderately malnourished,'" said Nih Mohammed, the records manager who handed out the rations. Fed with "Plumpy Nut," a special fat-rich paste made from peanut butter, Sharafuddin had gained enough weight to go home to his family, a high priority because most parents can't afford to remain at a clinic, away from their fields and their other children. "I'm happy that he's better, but he's still going to be hungry," said the boy's mother, Fatima, who like many Afghans goes by one name. Her five other children were skinny too, she said, though Sharafuddin was in the worst condition. He was born during Afghanistan's 2007 drought when the family had little food and Fatima didn't have breast milk. "He's been very ill three or four times, and he often has diarrhea," said Fatima, whose husband is a farm hand in a village about a one-hour walk from the clinic. "All my children and all the other children in the village would need rations too." Because there isn't enough food for everybody, the $1-million-per month handout to feeding centers focuses on new mothers and children under five, when hunger causes the most damage. "Since then, there are some areas where it has gotten worse," said Anna-Leena Rasanen, the WFP's nutrition program officer for Afghanistan. In certain zones, child malnutrition now hovers above the U.N.'s emergency level of 15 percent, she said. The WFP will spend US$319 million in Afghanistan this year, its second-largest humanitarian budget worldwide after Sudan. Aid includes handing out daily lunches to 1.4 million students as an incentive for parents to send their children, especially girls, to class. The Aqcha feeding center is the only one in a district of about 100,000 people. Dr. Sayed Ahmad Shah said three children died of hunger-related disease last year in the district, but none so far this year. "The whole purpose of handing out food is that we're now avoiding acute emergency cases," he said, touring the crowded clinic to reach a ward for the worst of the malnourished children. "Look, the room is empty. There are no cases," Ahmad Shah said, pushing open the door to the room, packed instead with pregnant women about to give birth. They had taken over the ward because their wasn't enough space for them elsewhere. "Well," said Ahmad Shah, who hastily closed the door after hearing surprised cries. "What I meant is that it's now empty of sad cases." 265 Afghan children found after being smuggled into Kent in the year to March 2008, representing a 55% increase on the previous year.